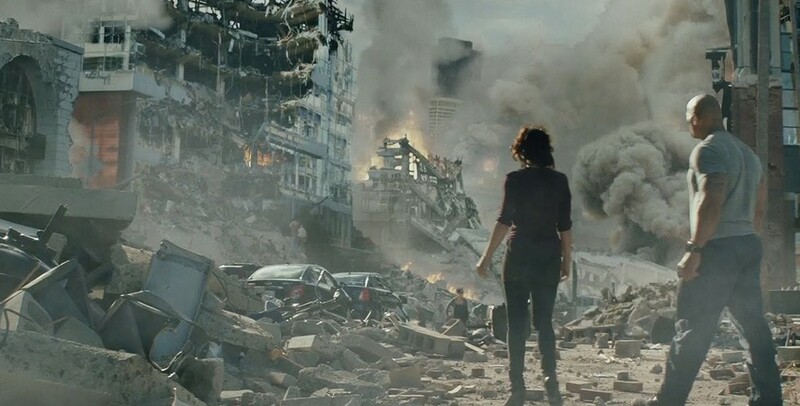 Very late last night, after a tedious day at work and a fancy dinner of vodka sodas and baseball games at a Chilis bar, I had the pleasure of watching the movie San Andreas with my teenager. I say pleasure because I was looking for mindless fun, and although cheesier than nachos from the concession stand, San Andreas fit the bill. Or maybe it was the vodka. If you're looking for a scientifically, seismically, anatomically, morally and any other -ally correct film, you've come to the wrong place. It is no more accurate or science-based than The Fly. San Andreas is about what Californians vehemently deny can ever happen in our lifetime - the ultimate destruction and annihilation of our state from an earthquake. From LA to SF (even Bakersfield gets a shout out) San Andreas gives us a gnarly CGI - in 3D AND Dbox if its playing in your area - disaster movie perspective of what could happen along the San Andreas Fault. 1. AT&T Park - home of my San Francisco Giants - is indeed, as I have always said, the greatest baseball park in America. When all of San Francisco is crumbling to the ground, The Rock sends scared, innocent SF civilians back towards AT&T Park and tells them to huddle close to the stadium structure for safety. After the massive tremor everyone asks his character how he knew where they should go, and the answer I heard come out of his mouth was, "Because it's the greatest ballpark in America! DUH!" Now I know why only the 1% can afford tickets to the games, and us real fans are blocked out - it's because those seats are earthquake proof! In the opening scene of the movie a teenage girl is driving recklessly and texting, but that's not what causes her car to fly off a cliff. No, it's the garbage she is listening to on her radio. I tip my hat to whoever wrote that song into the scene, because the hilarity was not lost on me. Don't let your kids drive and Swift. Or Swift at all if you have any taste. I don't have to elaborate and we don't need CGI to show us what we've already seen, but the scene with the Bay Bridge disintegrating really hit a nerve. I never drive over this bridge because I am afraid I'm going to be the one to hit the loose bolt that brings it down. Stay away. The Rock didn't even get near it to save people. If you have ever driven behind me you know two things: I avoid parking garages like the plague, and no matter how bad traffic is I will not stop under an overpass. Why? Because when the Big One hits I don't want to be buried alive in my car. (Yes, I've really given this thought.) 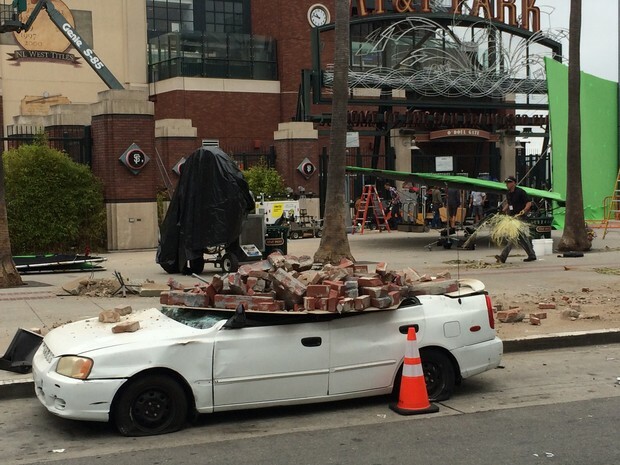 In the movie, several floors of buildings and parking garages crumble and stack-up on each other like hot cakes at IHOP. Nobody's getting out. Well, not unless you're The Rock's movie daughter. This goes without saying. 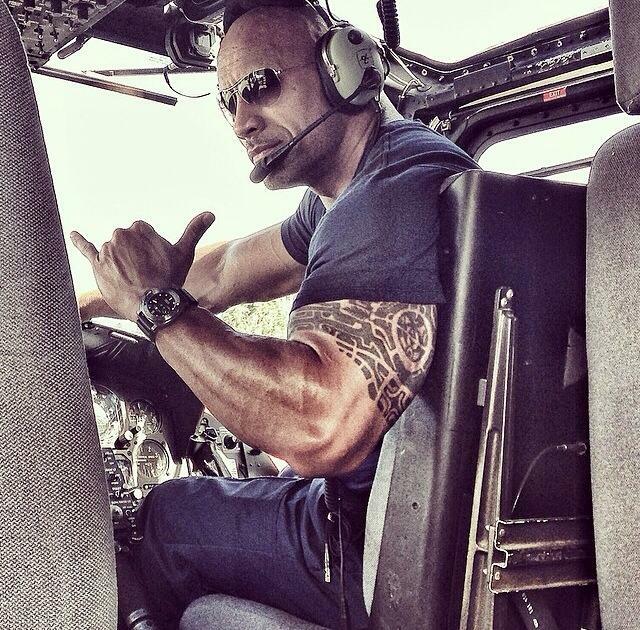 We're huge fans of Dwayne Johnson and would want him on our team during the Big One or Any One. Especially if he wears that costume from Tooth Fairy. There you have it! If you do decide to see San Andreas this weekend, have a few drinks and look for a 3D and/or DBox theater for the full California experience.